Trade Advocate: Indian-born business consultant Ani Agnihotri|! !| photographed at the Shri Swaminarayan Mandir|! !| spearheaded the first USA India Business Summit last spring. Stanley Bergman came to Georgia for directions to India that Google Maps can’t provide. Bergman is chairman and CEO of Henry Schein Inc., a provider of healthcare products and services to dentists, physicians and veterinarians, a New York-based Fortune 500 company with global sales of $6.5 billion last year. He was invited to be a keynote speaker at the first USA India Business Summit in May, but he had motives beyond a speech and a catered vegetarian lunch. “I’m here to network, to develop a joint venture with an Indian company,” says Bergman, who would like to sell dental supplies in the planet’s second-most populous nation, with the second-fastest growing economy (after China). And it was Ani Agnihotri who supplied the vantage point for Bergman and the collection of companies, CEOs, entrepreneurs and government officials who attended the summit at the Cobb Galleria, a ground-breaking event designed to promote business and investment between the U.S. and India. The summit emphasized boosting trade opportunities between the U.S. and India, but it also showcased the growing influence of Indian business catalysts and community leaders in Georgia, particularly Metro Atlanta, which has an Indian population estimated at about 80,000. It’s a vibrant and growing community that has immersed itself within the American mainstream while keeping close to its own culture and diverse traditions. India is a country of 28 states and 22 different official languages, yet it shares a common second language, trailing only the U.S. in the number of English-speaking people. India is the world’s largest democracy, with a population of about 1.2 billion, and it has the second largest diaspora in the world, with an overseas community of about 25 million. These are people who tend to stick with whom and what they know – Indian immigrants from Gujarat tend to stick with others from Gujarat. People who speak Telugu tend to find other people who speak Telugu. But some community-minded Indian Americans are striving to bring the disparate elements together as a unified, recognizable voice. One of the ways IACA accomplishes that is by commemorating India’s Independence Day (August 15) with the Festival of India, an all-day event at the Gwinnett Civic Center. Last year the event was linked with the U.S.’s Independence Day. The Festival’s “Flame of Independence” torch was lit at the statue of Mohandas Gandhi at the Martin Luther King Jr. National Historic Site in Atlanta on July Fourth. “India as a country is extremely diverse,” says Parthiv N. Parekh, editor-in-chief of Khabar, an award-winning monthly magazine based in Atlanta and geared toward the Indian-American community in the Southeast. “And the concept of diversity with assimilation is innate to Indians. The USA India Business Summit brought about 300 people together to see and hear Her Excellency, Meera Shankar, Ambassador of India to the U.S., and Georgia Gov. Sonny Perdue. They came to learn about potential opportunities in India for real estate and infrastructure, biotechnology and drug development, agribusiness and renewable energy, tourism and the hotel industry. Among other things, they saw the road ahead, as laid out by Bergman. “India has to be a critical focus for U.S. businesses,” Bergman told his audience. “Almost 20 percent of the world’s population is living in India, which is by far the world’s largest democracy with the largest middle class in the emerging economies. Mostly, it’s been Indian IT companies that have landed here, companies like Tata, Infosys, NIIT and Wipro, which established its largest U.S. operation in Atlanta in 2008. The company, which provides customer service, database management and software development for large global companies, employs more than 500 people at its office building in Buckhead, with plans to double that number in the near future. In February, Wipro won MACOC’s Global Impact Award for 2009 (a new award program honoring chamber members or partners for attracting, retaining and expanding international business). According to Agnihotri, the story of India’s economic renaissance is the story of India’s IT expertise. Especially when it comes to outsourcing. Who, for example, hasn’t heard an Indian accent on the line when calling for troubleshooting assistance for the home PC? Agnihotri says it was Indian technologists’ answer to exterminating the millennium bug that has helped change the world. “India was the country that answered the Y2K problem. That’s the No. 1 reason you see the India IT industry where it is,” he says. “Very few countries had the manpower that India had and has, young people in their 20s and 30s, who can communicate in English, willing to relocate with short notice. Agnihotri’s background is in software development, and he’s launched two companies in Georgia. Currently he serves as president and CEO of IIIrd Millennium Technologies, a boutique technology company that provides IT and outsourcing solutions for other companies. He also founded and runs the U.S. India Business and Research Center, a management-consulting firm that primarily helps Indian and U.S. companies find opportunities in either country. He was instrumental in starting the Georgia Indo-American Chamber of Commerce 11 years ago, and counts the Metro Atlanta chamber as one of his clients, arranging several trips in recent years to India for chamber executives and economic development professionals trying to attract Indian companies and investment in the U.S.
Viren Mayani, who was former Atlanta Mayor Shirley Franklin’s business manager, was on Delta’s first non-stop flight to India (about a month before the terrorist attacks in November 2008), along with a crowd of chamber and business development people. The Indian government announced last year that it will open a consulate in Atlanta. “That can only boost trade between Georgia and India,” Mayani says. Mayani serves on the board of the India China America Institute (which does research and educates legislators, industry and nonprofits on economic, political and security issues related to India, China and the U.S.); represents India on the Atlanta Advisory Commission on International Relationships; handles public relations for The IndUS Entrepreneurs, or TiE (which brought about 500 people and showcased 100 different start-up companies at the Atlanta Renaissance Waverly Hotel for the largest entrepreneurial summit in the Southeast); and serves as executive vice president of the Indian American Cultural Association. On top of all that, he has written for Khabar magazine for about 14 years. He’s a tireless promoter of economic development in Georgia, especially as a place for foreign investment. Last year he spent two days visiting Georgia’s ports, where imports from India had been increasing steadily, but in recent years had grown dramatically. It makes sense, also, to Sudhanva Char, an associate professor of business at Life University in Atlanta. “There are valid reasons to be rationally exuberant about the prospects of Indo-U.S. economic cooperation and faster growth in the volume of business between them,” he says, citing the improved political and economic rapport between the countries and the fact that they are the two largest democracies in the world. That matters. The opportunities for American investment, he says, could-n’t be more abundant. When he isn’t teaching business and economics to future chiropractors, Char teaches yoga – he’s done that for 20 years at a local temple. And he comes from a family of teachers. His brother is a teacher. Their father and grandfather were teachers. That concept of nobility is emblazoned on Mitesh Shah’s heart, his business card and his company’s website. The founder and CEO of the Noble Investment Group drew his inspiration (and his initial investment) from his father, Bharat Shah, who left Gujarat in the 1960s because, as his son (who answers to Mit) says, “The U.S. had always been the land of opportunity. His goal was to come here for an education, then go back to India to grow the family business. Bharat Shah had just taken a job in a meat processing plant when he was awarded a scholarship from Utah State to pursue a Ph.D. in food science, and after building a career at RJR Nabisco, he started investing in real estate. Mit Shah founded his company in 1993, after his father agreed to refinance the existing equity in the real estate business – which included a few small hotels. Today, Shah runs a company with 43 hotels (9,000 rooms, from budget inns to luxury resorts) in 16 states, employing 5,000 people who help generate about $400 million in annual revenue. Bharat also helped his younger son, Raj Shah, start a successful business – Pinnacle Real Estate Partners, LLC. Last year the brothers gave their father a mint condition thank-you gift. A few months ago Raj told Mit he’d found an auto broker in California who could get his hands on a completely restored, perfect 1965 Mustang. Red. A convertible. His kids stay with their grandparents often, and the tie to Indian soil may be tighter for the kids, like something that skips a generation. Shah’s kids go to a Gujarati summer camp, and to Sunday school, where they learn about the Hindu faith, about morality and purpose and karma and being a good human. “We’d really like them to be able to identify with their family’s culture,” Shah says. Every family has its own way. In Padma Rallapalli’s house, her children are required to speak Telugu, the official language of Andrha Pradesh, most of the time. For Ritesh “Rick” Desai, awaiting the birth of his first child, there is a dramatic reminder of cultural and spiritual roots in Lilburn, where the spectacular Shri Swaminarayan Mandir rises like a gleaming oasis in cluttered suburbia. Reaching 72 feet into the sky, with white spires and domes and made of Turkish limestone, Italian marble and Indian pink sandstone, the $19-million mandir opened in 2007. 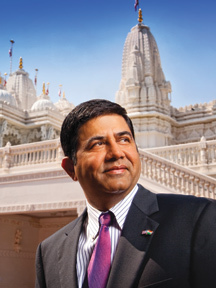 Desai, chairman of the Georgia Indo-American Chamber of Commerce, was one of hundreds of volunteers who helped build the temple. “When you’re in the mandir, you feel like you are in India – if you don’t look outside the walls to see the Publix across the street,” quips Desai, who moved to the U.S. when he was 12 and has found entrepreneurial success as a public relations consultant, real estate investor and international trade facilitator. It’s a place that helps keep him grounded in the culture he left as a boy, while he stresses the importance of assimilating seamlessly with the American mainstream.